If the myriad of Rick Wakeman’s studio works requires a guide for the uninitiated who don’t want to be playing a hit-or-miss game, the keyboardist’s live recordings are always the listener’s gain. So while 2003’s "Out There" felt like a quirky concept confection, on the road its excerpts lent themselves to a context which mixed time-tested classics with a newer material. 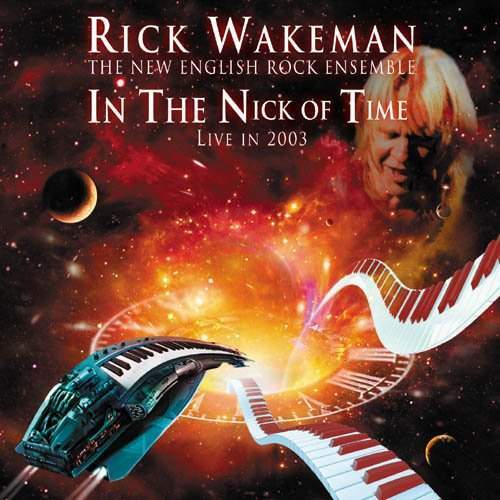 Choosing from his vast catalogue never was a challenge for Rick, what with his improvisational bent, yet the situation Wakeman started that UK tour in was. Shortly before the first gig Damian Wilson, who sang on the album, vanished and, although a purely instrumental performance didn’t pose a problem, the piano man called his choice voice Ashley Holt to step forward as he did many times before and supplant the suppleness of his predecessor with refined muscularity. Hence the title of this CD, a document of their heroics. Both veterans are in their dramatic element on “No Earthly Connection” here, yet the main thread during those concerts was cosmic-centered – not for nothing Wakeman reimagined Steve Howe’s “Wurm” and gave much string reins to Ant Glynne – so two fresh cuts, grand rockers “Out There” and the choir-enhanced “Cathedral In The Sky,” provide a lot of space for the guitarist to fly. He does just that on the opener “Catherine Parr” that is expanded with the unreleased “Beware Your Enemies” where synthesizers take over from the organ, before drummer Tony Fernandez and bassist Lee Pomeroy give rhythms an impressive weight to which Holt’s heavy lungs contribute nicely. Much lighter fares their groove on the slinky “White Rock” and “The Dance Of A Thousand Lights,” led by Rick’s elegant piano and faux orchestra and quoting the original “Journey.” Such curious selection of tracks makes this album very interesting but the ensemble’s delivery turns it into a celebration of sound. And there are also liner notes penned by the wiz himself whose http://dmme.net/reviews/books.html#wakbook raconteur skills are on par with his playing.